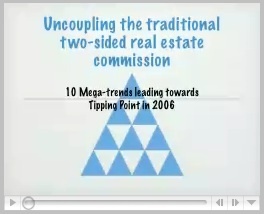 A tipping point in the real estate revolution? have pushed the obsolete commission structure to a tipping point; but from the real estate consumer’s perspective, the commission won’t reach a break point until the traditional two-side MLS commission is "decoupled" — a recommendation the Consumer Federation of America first made fifteen years ago. What series of actions are needed next to break-up the two-sided commission? That’s the discussion question asked by this 90 second video (which can be paused at any point), originally prepared for federal regulators but never officially submitted at the end of last year. The answer to that question will unlock billions of dollars in consumer savings annually, so comments from both real estate change agents and consumers are needed below, recorded on our readers’ line (617-876-2117), or sent privately to RECafe@mac.com. 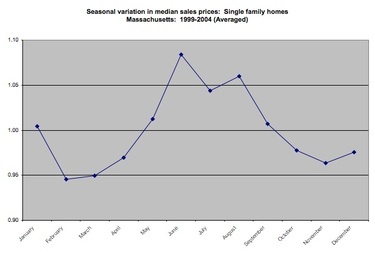 The Massachusetts Association of Realtors will release their “official” housing stats for March 2006 on Tuesday April 25. If there is interest, we can begin our own “unofficial” calculations now using housing data from a number of sources including the MLS and registry of deeds. If you have a question you’d like us to try to answer, please post it to the comments section below, email it to RECafe@mac.com, or leave a message on our reader line: 617-876-2117. Space is limited for the next bubble hour, so please email us if you would like to participate online or in person. Transcripts from the last two bubble hours are available by request. Link: Bay State exodus 2d only to N.Y. – The Boston Globe. Link: Inman News – Real Estate News and Advice for Buyers, Sellers & Investors.